Life Cycle: 2-4 generations per year depending upon local climate; adults over winter in weed and plant duff. Eggs laid in plant tissue; 5 nymph stages – all eating the same food as adults. Plants effected: Numerous vegetables, fruits, herbs, ornamentals, and weeds; foliage and fruit deformation and/or discoloration. Insect Habit: Hide in leaf axils; piercing-sucking mouthparts injures flower and fruit buds. Not noticed until damage is seen. 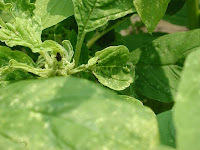 Control: Removal with nets (only on plants where leaves and blossoms should not be injured), control weeds in and around garden/field, spray Pyganic®, white sticky traps, pyrethrums, Safer® Insect Soap, Diatect®V, Golden Spray Pest Oil™, Surround®WP (repellent). Nice post. I can use all the help I can get id pest. I was over run by cucumber beetles this year. They total destroyed all my cucumber plants and severely stunted my squash plants, even my butternuts suffered. Used pepper spray, and hand picking but lost the battle. Finally used sevn, and this gave my squash plants a break. Could use more info in pest and what I can use on them. I try not to use pest. Preventive action would be a big help. We're going to try to make this a regular column. We know how hard it can be to deal with pests, and I'm sorry the cucumber beetles got the better of you this year. destroying my tomatoes and green beans this year. Are there tomato varieties etc resistant to Curly Top? Any suggestions? How about leafhoppers ? After doing some research I think that's whats been attacking our carrots. The leaves get reddish, lots of extra bushy growth both above ground and under ground. I read that interplanting with petunias helps, does it really ? Any other ideas ?